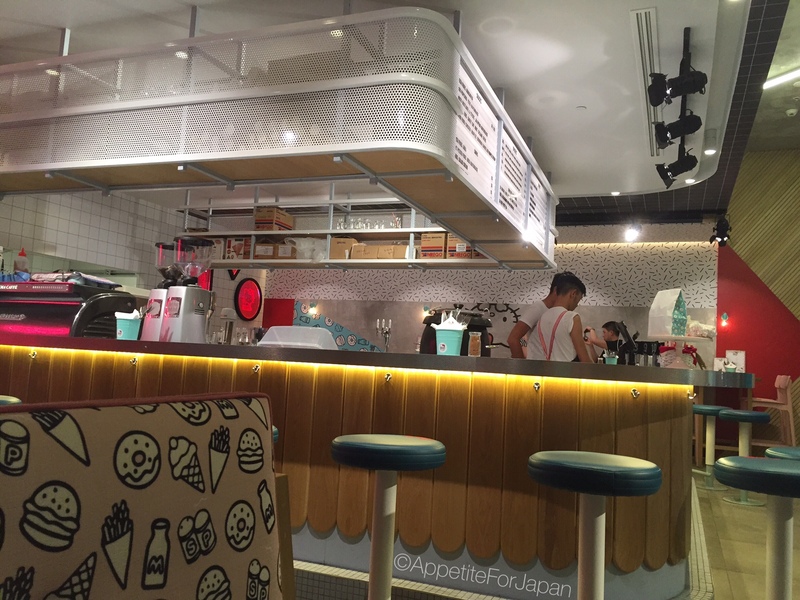 Unlike Japan, themed cafes and restaurants are not a big thing in Australia… yet. I’m going to throw this out there and predict that they will become more popular in Australia over time – especially in cities such as Sydney and Melbourne. 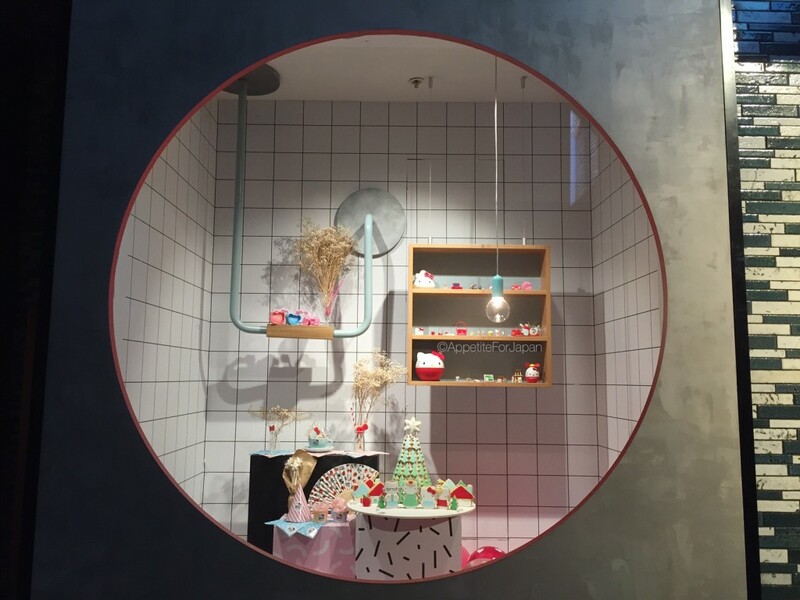 For now, it’s mostly about pop-up restaurants and themes which merely revolve around food (rather than Japan’s crazier concepts such as Harajuku’s Kawaii Monster Cafe), so it’s pretty exciting to see a a genuine themed restaurant in Australia which is here to stay. 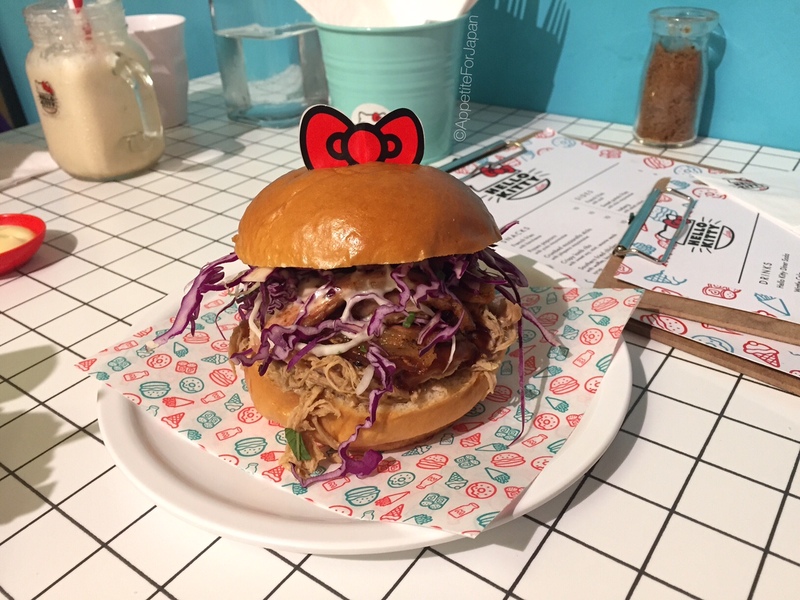 It’s not Australia’s first Hello Kitty themed restaurant – the smaller city of Adelaide in South Australia opened about a year earlier – but it is still one of Australia’s only themed eateries. And it just so happens to be the first Hello Kitty diner in the world. I missed the opening of the Hello Kitty Diner (November 1 – Hello Kitty’s birthday) because I was busy eating my way around Japan as usual. In fact, I was eating pancakes at a Hello Kitty cafe in Tokyo around the same time. Sure, I may be a couple of months late to the party here, but on the plus side, I didn’t have to deal with waiting in a long queue as people did a earlier on, and I was able to order the elusive freakshake that was on the menu but unavailable to order until more recently. 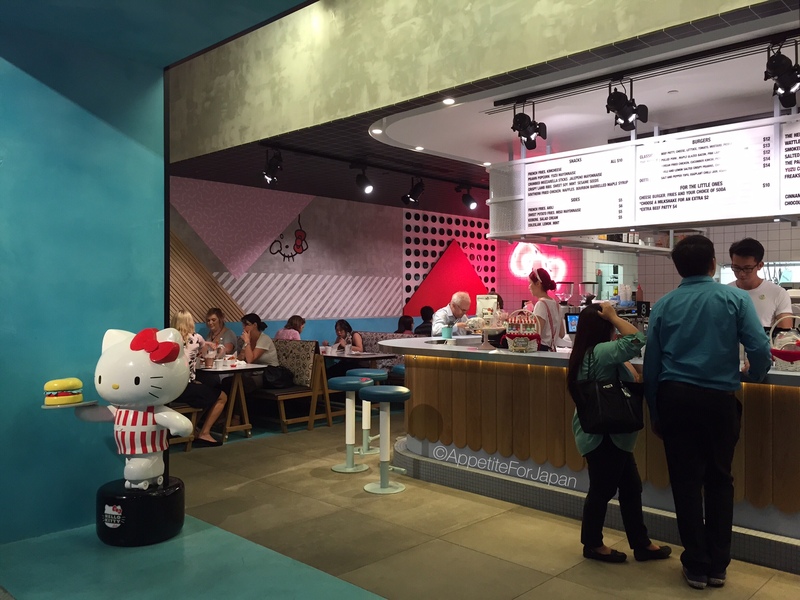 The Hello Kitty Diner is located in ‘The District’, a relatively new development full of interesting new restaurants at Chatswood Interchange (right above Chatswood Station) on Sydney’s North Shore. Being a diner, the restaurant is all about burgers. It’s smaller than you might expect, so it reaches capacity pretty quickly, resulting in queues out the front during busy times such as weekends. 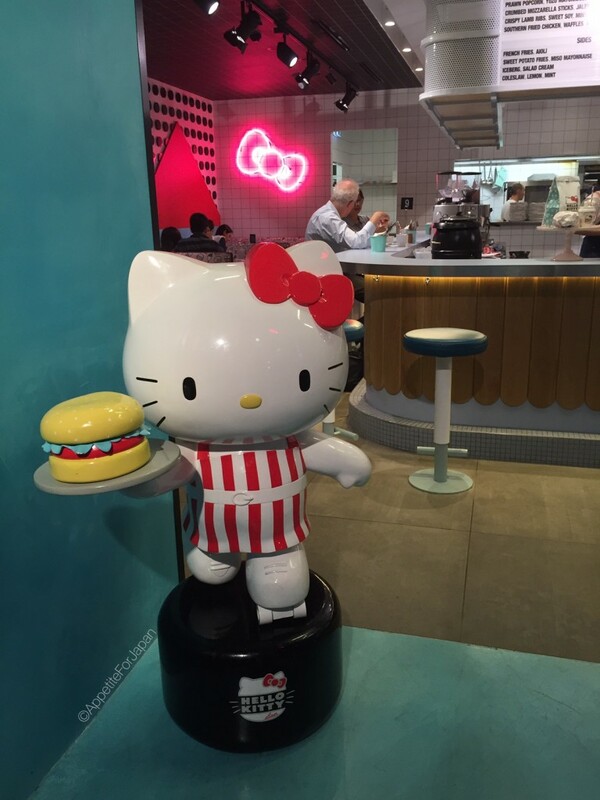 When you reach the diner, you’ll be greeted by a statue of Hello Kitty on roller-skates, holding a burger – the Hello Kitty Diner’s mascot. I was expecting a large statue around my height (like the one at Cafe de Miki with Hello Kitty in Tokyo), but this one is quite small. When it comes to Hello Kitty themed decor, the Hello Kitty Diner is quite sparse. A lot of people were expecting it to be super kawaii and all decked out with pink and bows and lots of visual references to Hello Kitty. This seems like a reasonable assumption to me, and I was expecting more Hello Kitty too – both in the decor and the food. 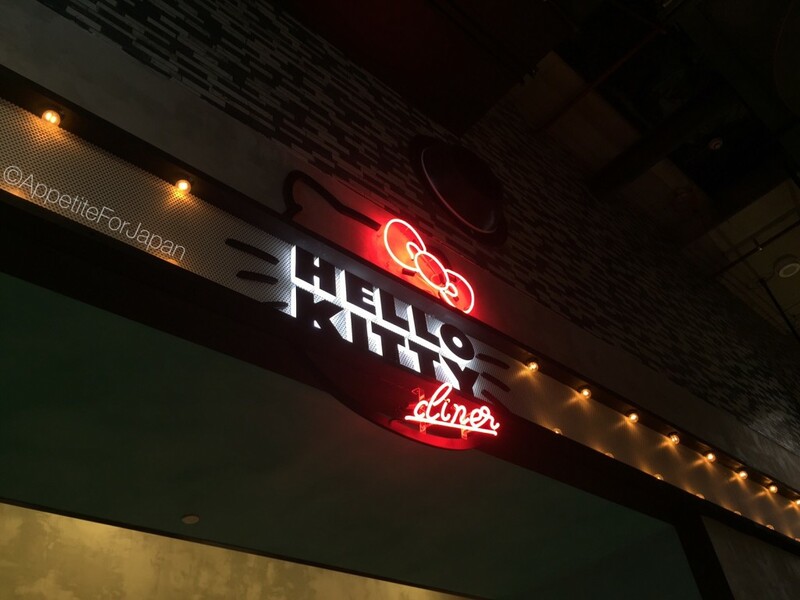 There’s a large neon bow on one wall, and three neon windows with images of Hello Kitty on another. Aside from these, and two other pictures of Hello Kitty on the walls, that’s pretty much it. Then again, this is a diner, not a cafe. 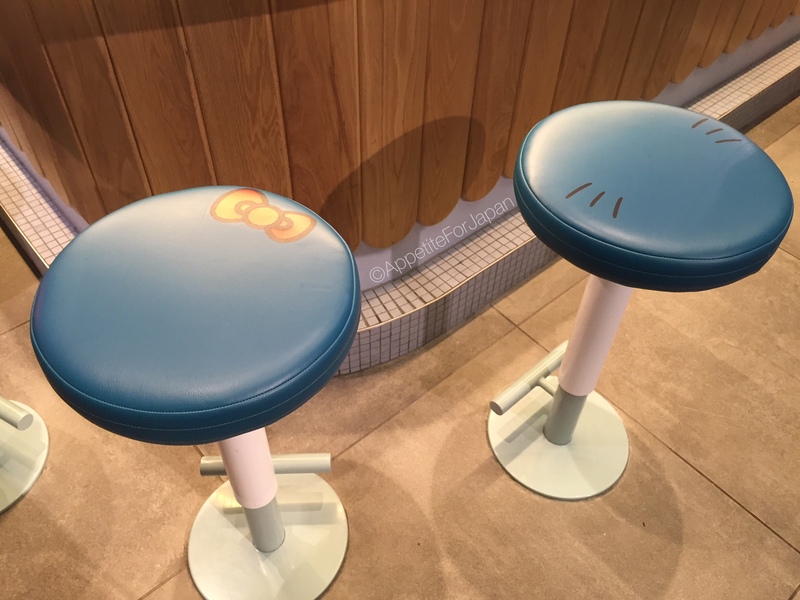 The bar stools have images of Hello Kitty’s famous bow and whiskers on them, and the fabric booth seats have images of food on them, including burgers, doughnuts and ice-creams. Orders are placed at the counter (the staff give you a number and bring your food out in quick succession once it’s ready), and if the restaurant is busy and you can’t get a table, there’s always the option of the bar seats. The staff are friendly, and the service is very efficient. 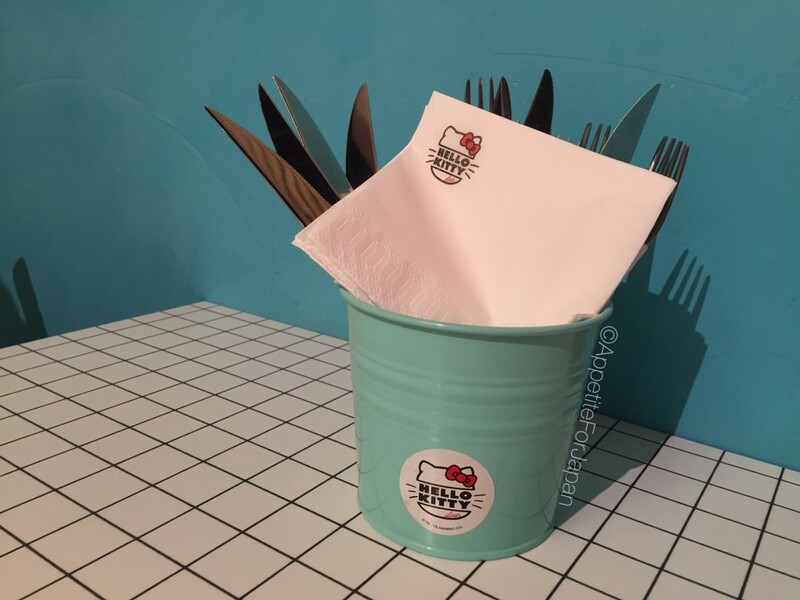 The Hello Kitty Diner’s logo is pretty cute. It’s a half burger, half Hello Kitty. The logo is out the front of the restaurant, as well as on the Mason jars, napkins and the cutlery buckets. 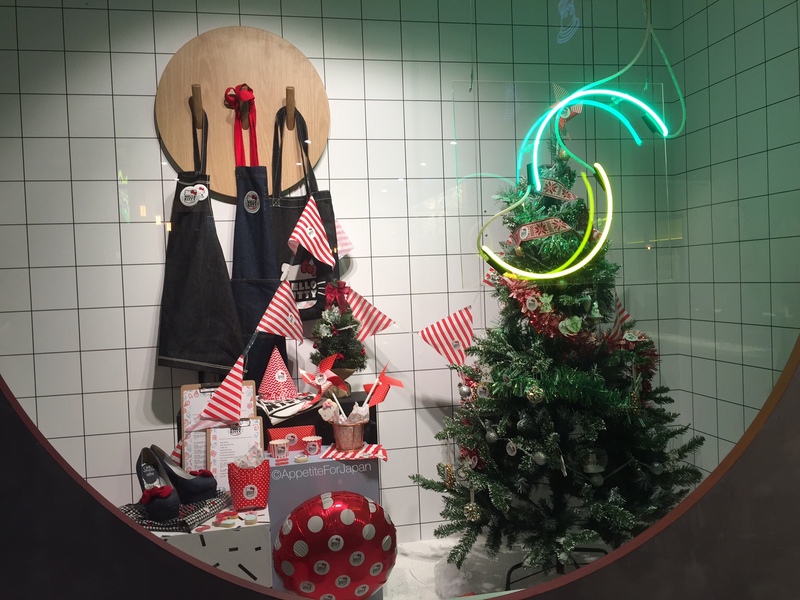 Window displays out the front of the restaurant showcase Hello Kitty merchandise, although it’s not for sale (they do, however, sell Hello Kitty nail polish). 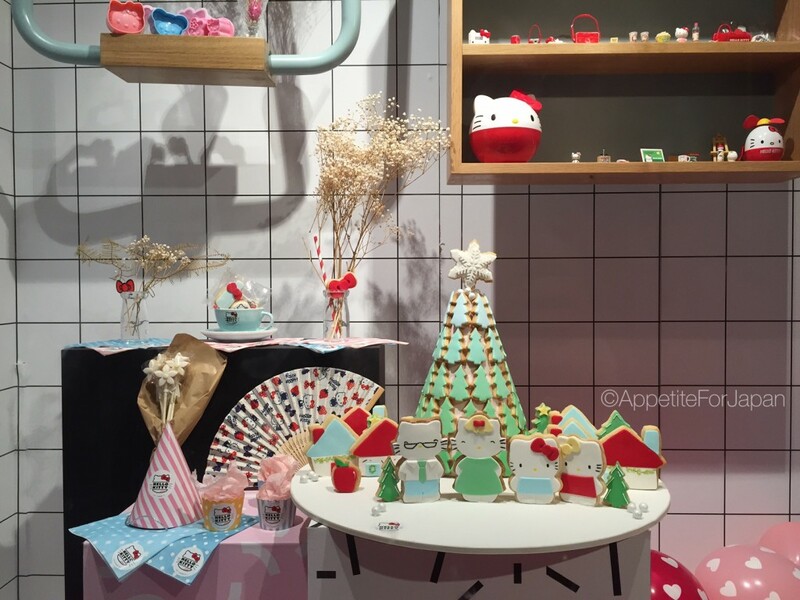 The other window has what looks like Hello Kitty gingerbread biscuits. It would be great if they sold cute Hello Kitty treats to take away. Alas, these are just for the display. The food menu is only small, with five snacks, five burgers, four sides, and two desserts (plus additional daily specials). The burgers were created in collaboration with Warren Turnbull of Chur Burger fame, which may be of interest to my Australian readers. The drinks menu is also fairly small, but offers some interesting flavours of soft drinks and milkshakes. Don’t expect to find anything ordinary to drink here! 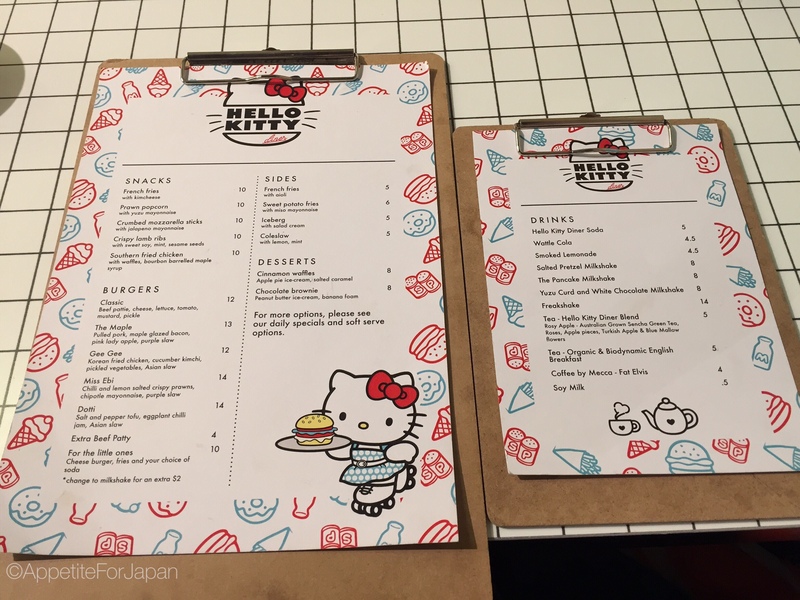 Above: the Hello Kitty Diner food menu. 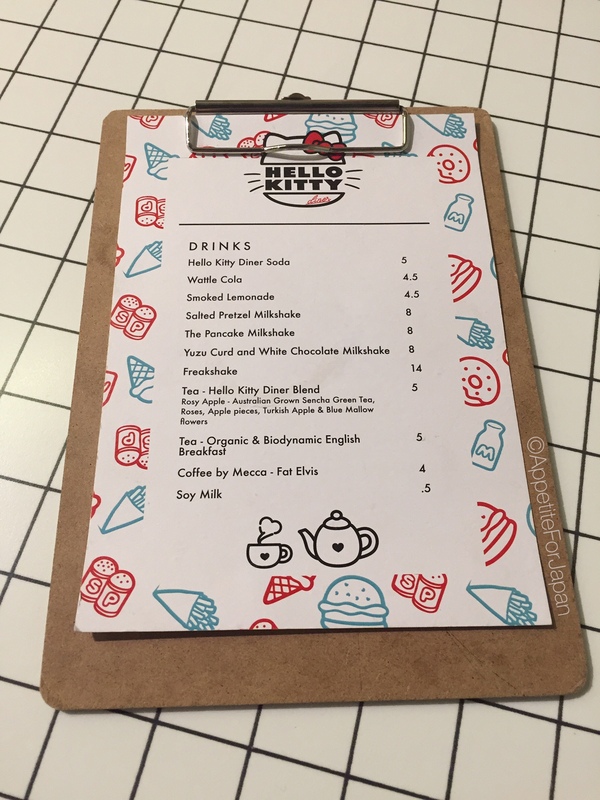 Above: the Hello Kitty Diner drinks menu. We tried almost half of the items on the food menu, so here they are! Above: French fries with kimcheese – $10. Yes, that’s exactly what you think it is: fries with cheese and kimchi. While Sanrio is Japanese, kimchi is Korean, but that doesn’t matter because the Hello Kitty Diner isn’t here to serve Japanese food (although it does take inspiration from Japan here and there). If these don’t look good to you, all I can say is that you should never judge a book by its cover. The kimcheese fries were one of my two favourite items on the menu. 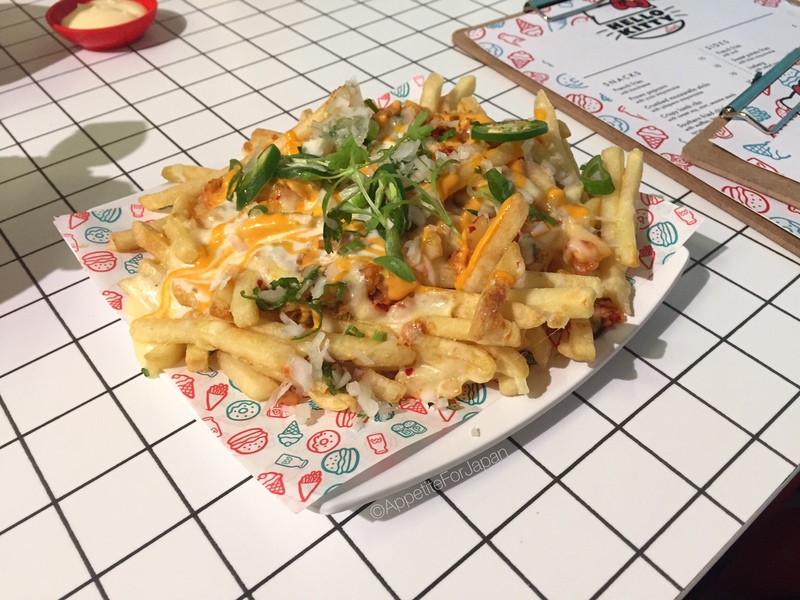 The fries were freshly cooked in clean oil, covered in cheese and kimchi (and plenty of salt), and are an absolute winner in my books. The serving is enough to share with a few friends. 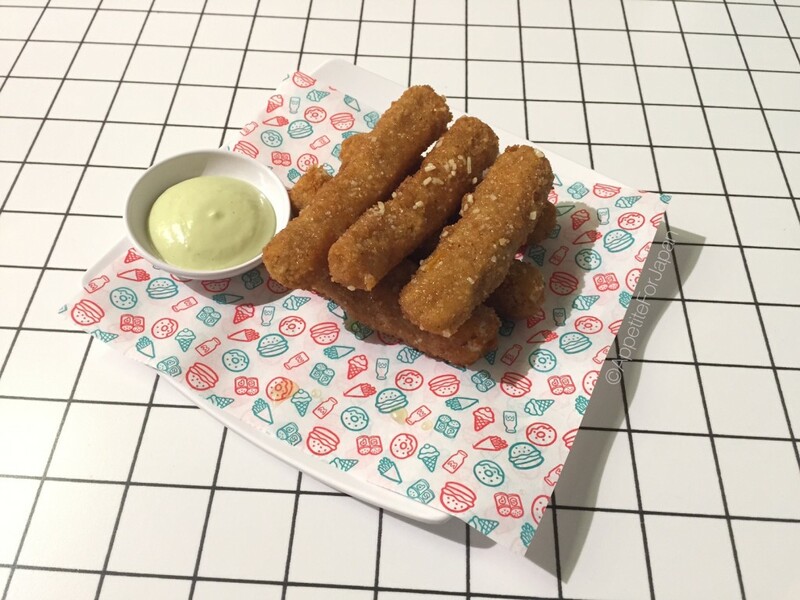 Above: Crumbed mozzarella sticks with jalapeno mayonnaise – $10. These came out very quickly after we ordered. Six chunky strips of mozzarella cheese, crumbed and deep fried. Not exactly slimming (and let’s face it, nothing on this menu is slimming! ), and they were pretty oily, but they were also pretty tasty. The jalapeno mayo added a spicy hit (not dissimilar to wasabi mayo). Again, this is a good one to order and share with friends. Above: French fries with aioli – $5. This is a reasonably large serving of fries, intended as a side to your burger. The burgers themselves don’t come with fries, so these are optional. Again, these came out hot and freshly cooked in nice clean oil, and had plenty of salt on them. If you’re ordering a few snacks alongside your burger, you might not need these. 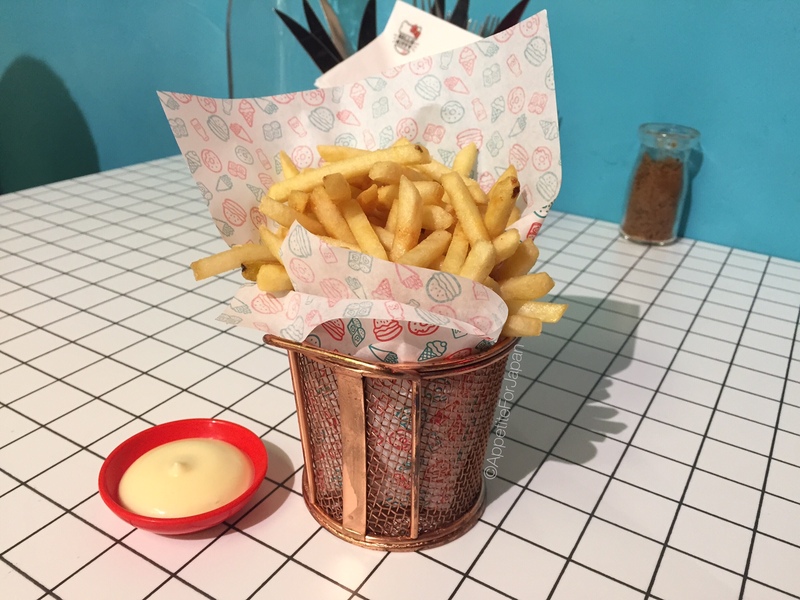 Our snacks and sides were shared between four people and we felt that we’d over-ordered, so – as good as these fries were – we would consider skipping these next time simply because we didn’t need that much food. 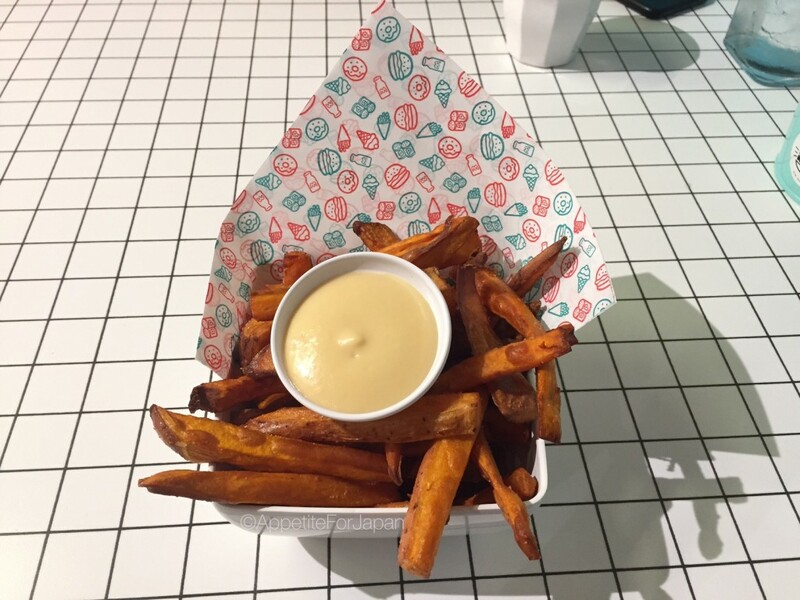 Above: Sweet potato fries with miso mayonnaise – $6. Another winner! It’s the miso mayo that really makes this dish. Along with ‘kimcheese’, I can’t help but wonder where these delicious concepts have been all my life. This is a big call, but I think miso mayo is possibly the best condiment ever invented for chips. I was also dipping the kimcheese fries in this. If you like miso, I cannot recommend this tasty, salty goodness enough. Unless you have a huge appetite, one serve is probably enough to share (especially if you’re getting other snacks and sides with your burger), and I highly recommend giving this side a try. Above: Classic burger – $12. This is your standard burger – beef patty, cheese, lettuce, tomato, mustard and pickles. I thought this was pretty decent. My only complaint is that the burger bun was cold. They should really think about heating the burger buns too. 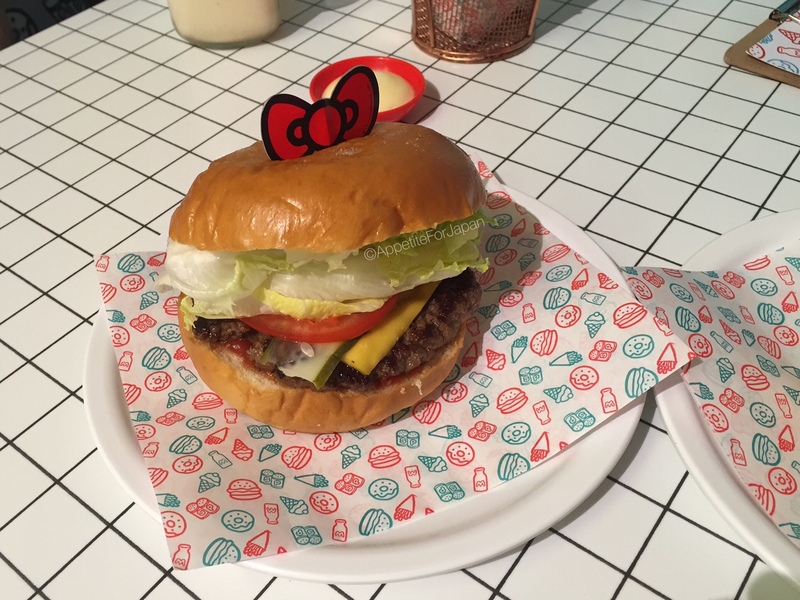 The burgers come with one of two Hello Kitty toothpicks. One has the iconic Hello Kitty bow, and the other has the Hello Kitty Diner’s logo. I would like to see them take the theme a bit further by perhaps having something Hello Kitty related (such as the bow or whiskers) toasted into the top of the bun. This burger incorporates several ingredients that are in (at least in Australia) at the moment – pulled pork, maple glazed bacon, pink lady apple and purple slaw (coleslaw with purple cabbage). My partner ate this one and said that the pork was a little dry, and like the rest of us felt that it could be improved by heating the bun. He otherwise enjoyed it. 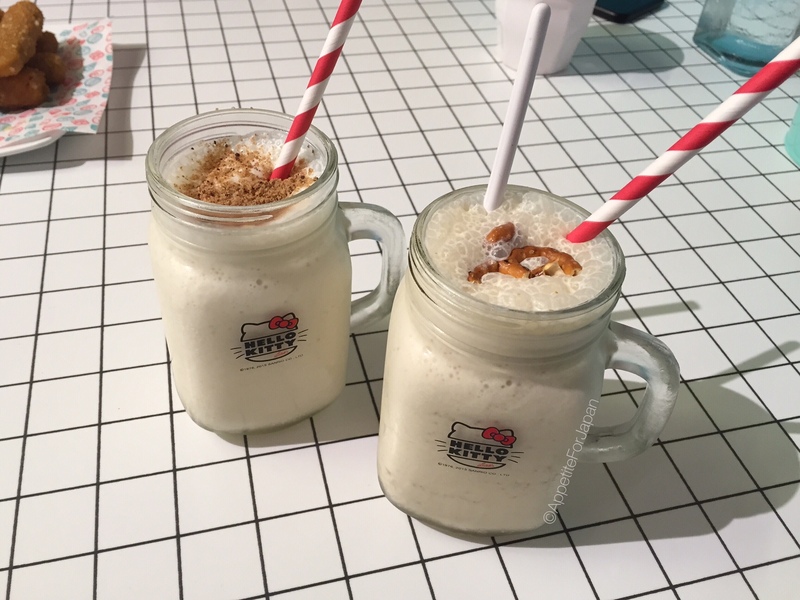 Above: The Pancake Milkshake (left) and Salted Pretzel Milkshake (right) – $8 each. Apparently Mason jars and paper straws are still in, and milkshakes are getting more and more expensive. Remember that scene in Pulp Fiction about the $5 milkshake? Well these are about 1/3 the size and they’re $8 each. And no, there’s no alcohol in them (the Hello Kitty Diner doesn’t serve alcohol). Even taking inflation into account, this seems pretty steep. Maybe I’m starting to show my age, but back in my day, a milkshake was in a really big cup, and came with a second thing to top it up. Then again, when I think about that time when I drank an $8 glass of flavoured milk at a themed cafe in Japan, an $8 pancake flavoured milkshake doesn’t seem so bad. Exorbitant prices aside, the milkshakes are quite nice, and the flavours interesting. I preferred the pancake milkshake which tasted of maple, and my partner was a big fan of it. The salted pretzel one seemed to have actual chunks of what I think must have been pretzel. I’m not completely sold on this one. The third flavour, which we didn’t try, is yuzu curd and white chocolate (yuzu is a citrus fruit) – I’m making a mental note to try that one next time, as it sounds pretty nice. 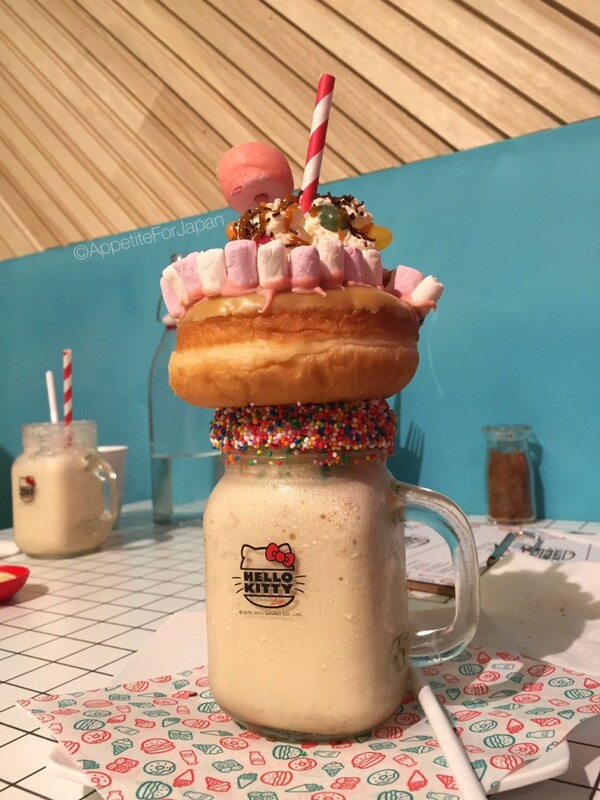 Above: Last but not least, the much anticipated Hello Kitty Diner Freakshake – $14. 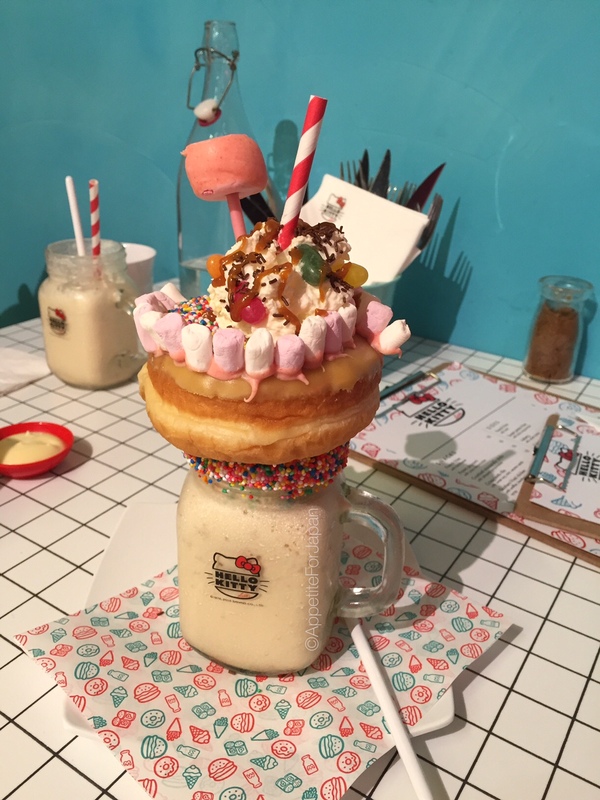 The freakshake – a giant monstrosity of a milkshake incorporating all kinds of things such as doughnuts, cream, sauce, lollies and sprinkles – is all the rage in Australia at the moment (something which I’m pretty sure we’ll all be laughing about in a couple of years). The freakshake has been on the Hello Kitty Diner’s menu since it opened, but they weren’t available until more recently. 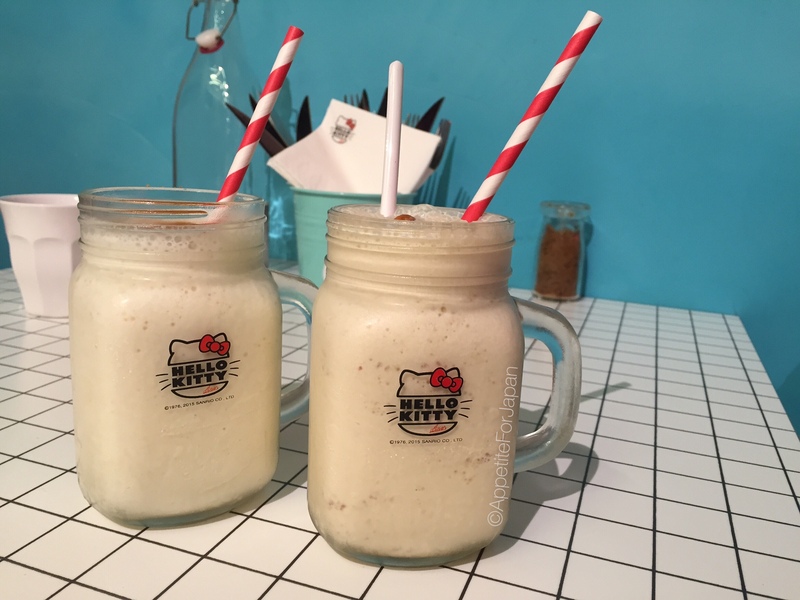 The Hello Kitty Diner’s freakshakes come in the same three flavours as their regular milkshakes. This is the salted pretzel freakshake. The rim of the Mason jar is decorated with hundreds & thousands, and on top of it there’s a caramel doughnut, pink icing, mashmallows, whipped cream, more hundreds & thousands, caramel sauce, jellybeans, chocolate sprinkles, and a marshmallow lolly-pop covered in icing (or is it pink white chocolate?). I had to order one – partly out of curiosity, and partly because I like to order the most outrageous thing that I can find when I go to a themed restaurant. It’s all part of the fun. Actually eating/drinking my way through it is another thing. I drank the milkshake and they put the doughnut in a paper bag for me to take home. Apparently almost everyone who orders the freakshake ends up taking the doughnut home rather than eating it there. 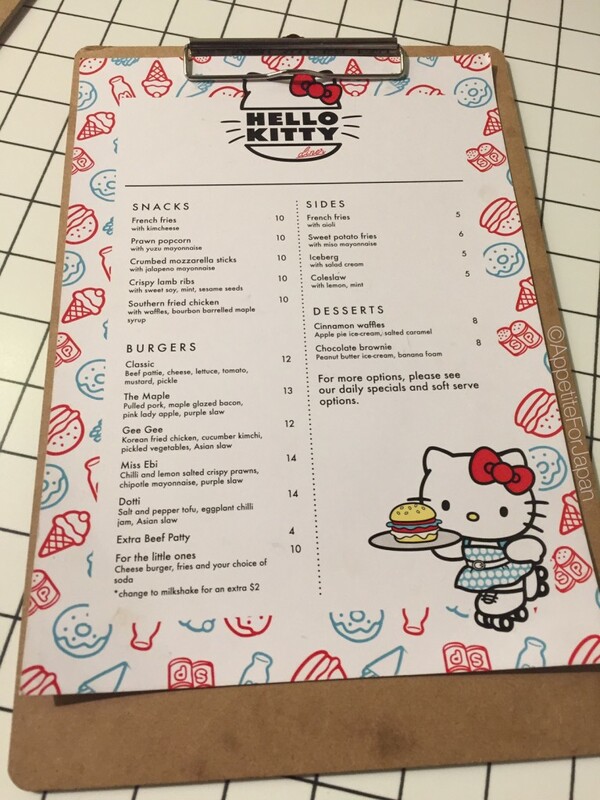 Would I recommend Australia’s Hello Kitty Diner? If you like tasty fast food with interesting sides, then I would definitely recommend it. For the most part I thought the prices were alright – it was only the milkshakes that I felt were overpriced – and I really enjoyed the food. I’ve seen some pretty average reviews, but I genuinely enjoyed the food. 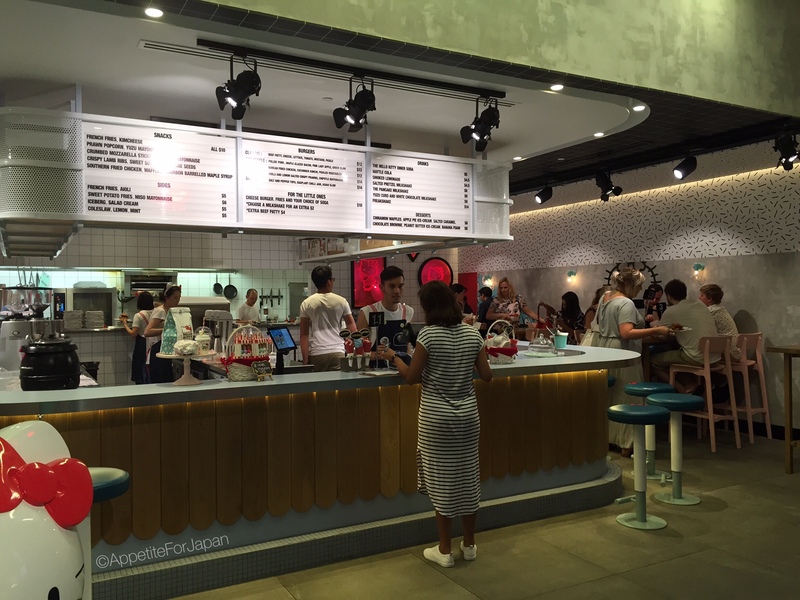 And while some people feel that everything on the menu is too expensive, it doesn’t seem any pricier than many other popular burger restaurants in Australia – and it’s certainly much cheaper than the themed eateries in Japan (those places can be really pricey!). The menu may be small, but we still managed to order more than we needed. Next time I’m in the area, I’ll go back for another serve of fries with ‘kimcheese’ and the sweet potato fries with delicious miso mayo. If you’re going specifically for the Hello Kitty theme, then I would suggest lowering your expectations, as it’s pretty light on the themed side. 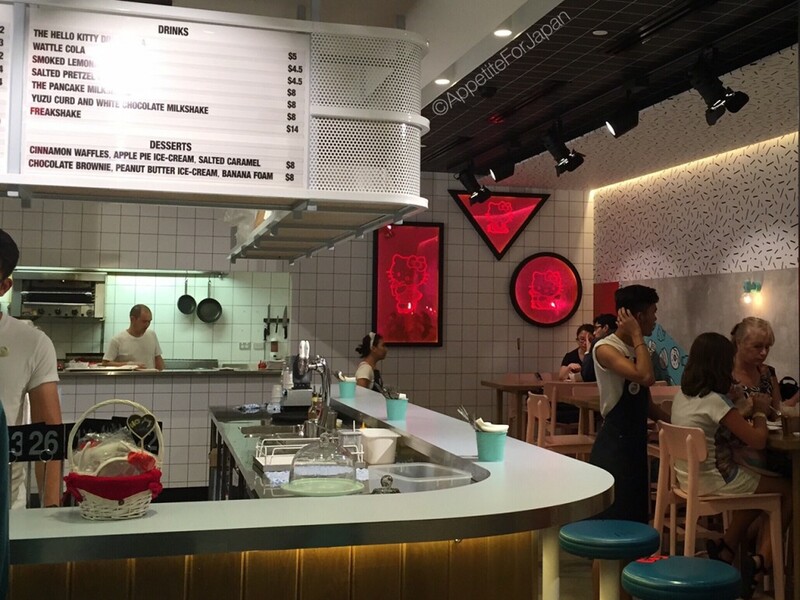 I’d like to see them add some more Hello Kitty to the decor, and to the food itself. 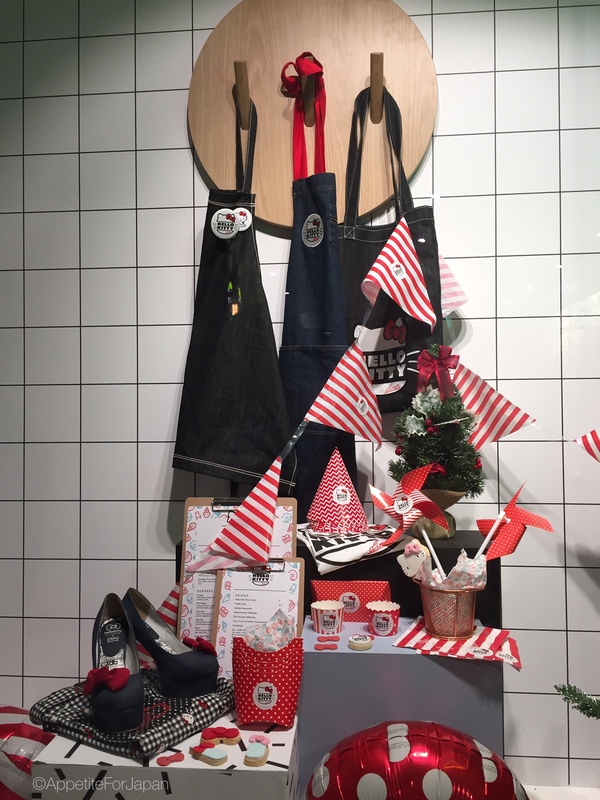 Most themed restaurants and cafes put hints of the theme in the food itself. This could be anything from a Hello Kitty bow toasted into the burger bun, to some kind of Hello Kitty related confectionery floating in the drinks. 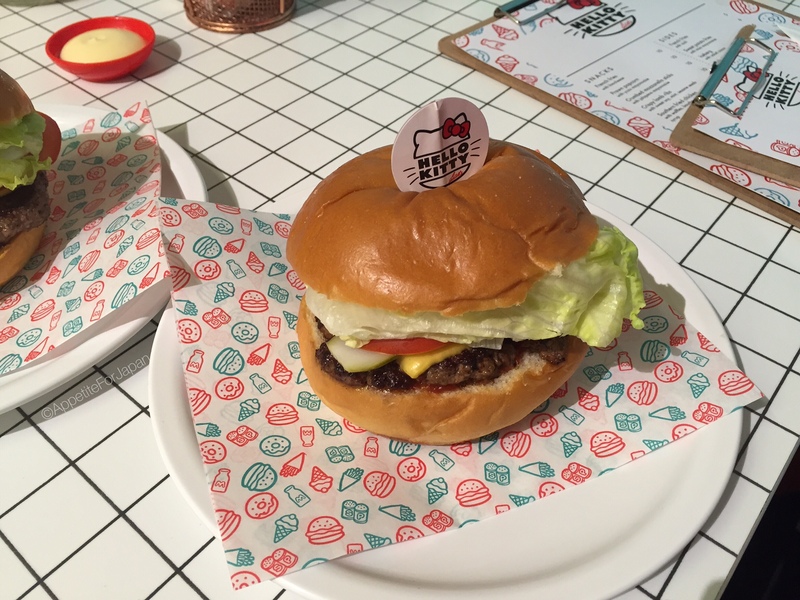 Japan really knows how to do themed food (click the ‘themed dining’ category at the top of this post – just below the title – to read about some of Japan’s best themed eateries), and I’d love to see the Hello Kitty Diner follow their lead. Nonetheless, I did enjoy my meal at the Hello Kitty Diner and I’m sure I’ll be back sooner or later. Catch the train to Chatswood. When you exit the ticket gates at Chatswood Station, turn left and walk until you see some escalators on your left. Take the escalators up to the street, and then immediately to your left take another set of escalators. Walk toward some large white doors – this is the entrance to ‘The District’. Walk through the doors, turn right and walk almost to the end where you’ll find the Hello Kitty Diner. Note that they are sometimes closed for private functions, so check their Facebook page before visiting. 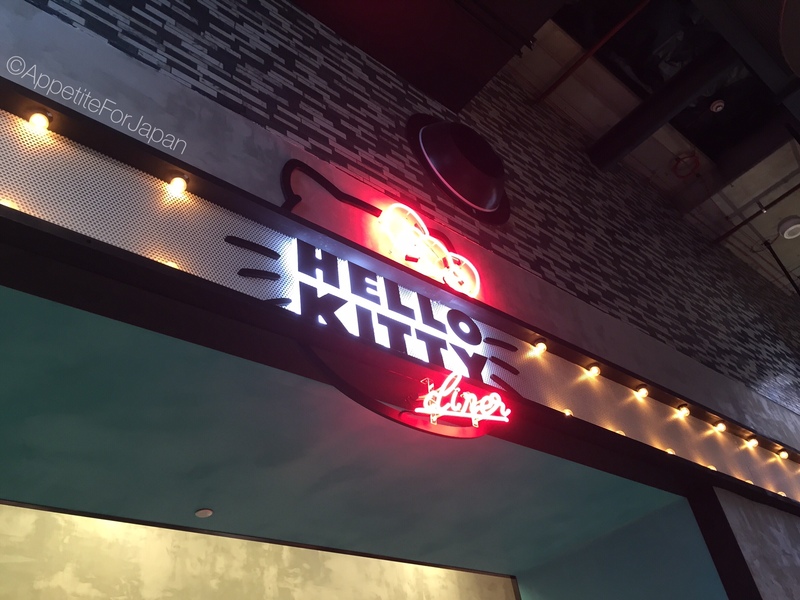 The Hello Kitty Diner does not take bookings (aside from private functions). It is busier on weekends and at lunch time/dinner time. The booth seats fit four to six people at the most, whereas the other tables seem smaller – the third option is to sit at the bar stools around the counter. In my next post, I’ll be returning to my usual programming – that is, writing about Japan – with a write-up on Uobei Sushi, where sushi flies at lightening speed. Stay tuned for more!